It's Metallica Week on MusicRadar! Friday 12 September marks the long-awaited release of Metallica's Death Magnetic album. It's already been acclaimed as a major return to form, and is one of the most-anticipated albums of 2008. To mark its release, MusicRadar is going to give you a dose of Metallica every day until Friday. Today is Day 2! 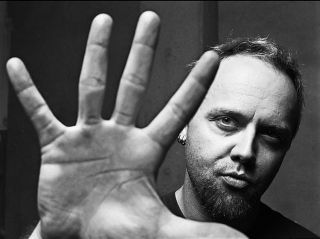 Here, we have an excerpt from an exclusive interview with Metallica drummer Lars Ulrich. In this interview with drum magazine Rhythm he talks about the recording of Death Magnetic, working with producer Rick Rubin and much more. To read the full interview, make sure you buy October 2008's copy of Rhythm magazine, on-sale 30 September. "Well, thank you. Rick Rubin is a big fan of keeping things organic. We found out along the way that he's not much for samples or triggers or anything artificial. He's a pretty straight-ahead kind of guy - he doesn't like reverb, he doesn't like anything on the drums." Did Rubin push you to play the drums better? "He pushed me to listen to the other guys. We have this tendency towards, 'You start with the drums, and then you add this, and this...' like you're building a house, with the drums the foundation and everything else an afterthought. But he didn't want that - he wanted us all to play together and interact with each other." You've had a lot of flak over the years from people who accuse you of being a poor drummer. Does that ever trouble you? "It hasn't bothered me for about 15 years. I'm no Joey Jordison, I'm no Mike Portnoy, and I have nothing but love and respect and admiration for all those guys. "When I hear some of the young dudes, they blow my mind with what they can do with their feet and stuff - but it's not something that makes me go, 'I need to feel better about myself so I'm gonna learn how to do what they do with my feet'. "I'm not a particularly accomplished drummer but I am very, very, very good at understanding the role of the drums next to James Hetfield's rhythm guitar. "I guarantee you I'm the best guy in the world for that, and that's enough for me!" Get October 2008's copy of Rhythm magazine, on-sale 30 September, to read what Ulrich also reveals about his drum set-up, what he thinks of bass players Cliff Burton, Jason Newsted and Rob Trujillo, and much more. Subscribe to Rhythm. Metallica Week: Day 3 tomorrow! Tomorrow, it's Day 3 of MusicRadar's Metallica Week. And we've got a classic 'Black Album'-era interview with James Hetfield. See you then!